The year was 1954. A 19-year-old singer named Elvis Presley was just starting out, often singing on the then famous Louisiana Hayride radio program. He was a young, good-looking singer, but mostly minus the wriggling, shaking, and sneering that were to naturally develop over time. But it didn’t take long before teenage girls began to take notice of the budding star. Elvis’ performances on the show began to acquire a loyal, fervid audience, even beyond the 28 states to which the Louisiana Hayride program was being broadcast. 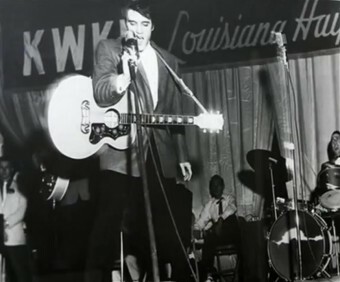 When Elvis had first performed on Hayride in 1954, he had done so under a contract that paid him $18 per week, or about $156 today. Of course, as his star rose and he no longer needed the money or the show to help get his music out there, he sought to end his relationship with the broadcast, offering to buy out the rest of his contract. While it isn’t well documented precisely how much Elvis had to pay to get out of the deal, it is generally reported to have been in the vicinity of $10,000 or about $86,000 today. But as a stipulation to the buyout, he had to perform one final show. This brings us to December 15, 1956, during Elvis’ final Hayride performance. By this time, Elvis had already filmed his first hit movie “Love Me Tender,” which was released a month earlier on November 15th, and he had made several headline-grabbing appearances on national TV, including a few months earlier getting paid $50,000 (about $429,000 today) to appear on the Ed Sullivan Show in an episode that captured an astounding 82.6% of the television audience within the show’s reach, or about 60 million viewers. The Wall Street Journal also reported that Elvis merchandise had brought in a cool $22 million (about $189 million today) up to that point, outside of any record sales. Needless to say, the quaint December Hayride show at a relatively small building in the Shreveport fairgrounds was sold out. 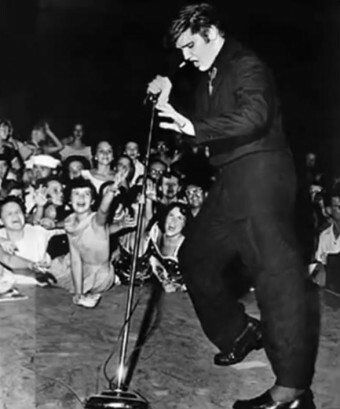 When Elvis took the stage as the third performer of the night, approximately 10,000 excited teenagers screamed their heads off throughout his set, mostly drowning out Elvis and his band according to disc jockey Frank Page who was in attendance. Unfortunately for the other performers that were to take the stage after Elvis, when the line-up was scheduled, Elvis was not put last despite headlining that particular show. As you might imagine, there were a whole lot of people in the seats that came only to see Elvis, and when it was clear he wasn’t coming back out for an encore, many got up and headed for the exits, some hoping to catch a glimpse of the King outside. Little did Hoss Logan know that his off-the-cuff remark would go down in show business history. But it wasn’t Logan who popularized the expression; that honor goes to Al Dvorin, who is often incorrectly given credit for coining it. Dvorin entered the Elvis scene later, when hired in 1957 by Presley’s manager Colonel Tom Parker to help out as an announcer at Elvis’ concerts, among other tasks. The remark was subsequently used by Dvorin to signal that Elvis Presley had left a concert venue when he’d finished a performance. Of course, when Logan had originally uttered the words, he was trying to get people to stay, but Dvorin was using it to let everyone know they should leave as there would be no encore, or no further encore if the King had already given one. While Dvorin used this expression for many years to signal the end of an Elvis concert, it wasn’t until 1972 that it really hit the mainstream thanks to Elvis’ Madison Square Garden concert, which resulted in the album Elvis as Recorded at Madison Square Garden. The album peaked at #11 on the Billboard charts and has sold well over 3 million copies to date. Most pertinent to this article, the record includes an “End Theme” track where you can hear Dvorin stating “Elvis has left the building. Thank you and good night,” exposing many who’d never gone to an Elvis concert to this little catch-phrase. In time, the expression became a saying which no longer referred to Elvis personally, but to mean the excitement is over; the proceedings (of whatever kind) have come to an end, among many other places notably used in the 1996 Independence Day where Will Smith yells, “Elvis has left the building!” and Jeff Goldblum then does a little Elvis impression, “Uh, thank you very much,” when they escape the alien’s mother ship. Elvis didn’t naturally have black hair. He was born a blond and, when he got older, his hair was more of a sandy blond color. He started occasionally dying it black all the way back when he was in high school and eventually just always kept it that color. Elvis once wrote a letter to President Nixon asking to become an undercover narcotics cop. Nixon responded by personally giving Elvis a Bureau of Narcotics and Dangerous Drugs badge. During Elvis’s autopsy, doctors found 10 different drugs in his blood stream.